Along with most sensible people, the AFL would like to see fewer ugly stoppages and less of the grinding, Ross Lyon-y tedium that has spread through the league like a malicious spreading thing in recent years. To achieve this, the League has reduced the cap on player interchanges to 90 per game and tightened the interpretation of the deliberate out of bounds rule. An intervention like this was sorely needed. 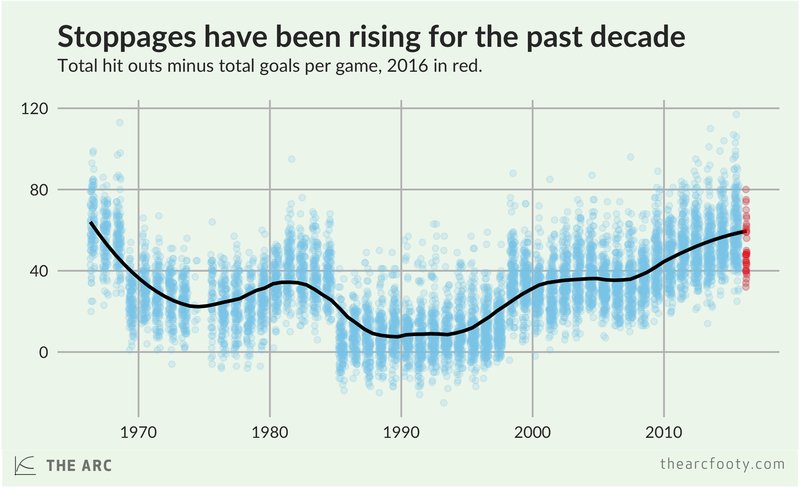 Stoppages are ugly as hell, and they’ve been rising steadily for the past decade or so, returning to their highest level since the mid-1960s. It looks like the rule changes have worked. The graph below directly compares the number of stoppages in 2015 and 2016, up to the end of Round 4. 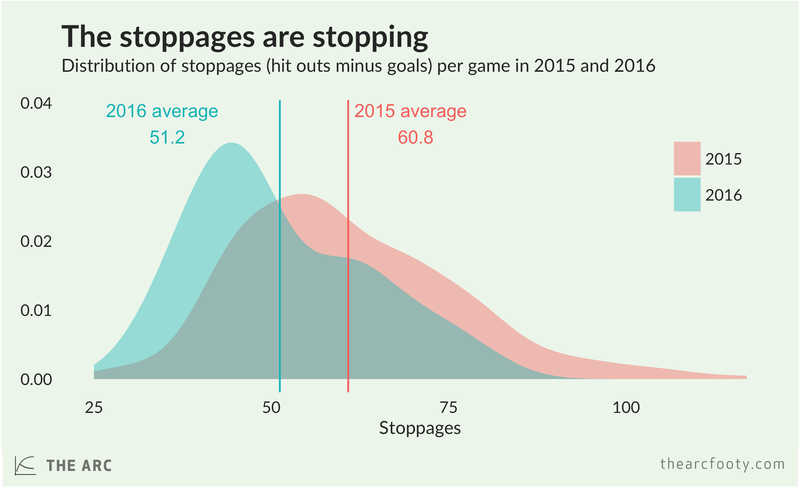 It shows pretty clearly that we’ve seen a lot more games in 2016 with a relatively low number of stoppages. The average number of stoppages has fallen by nearly 10 per game, from 60.8 to 51.2. That’s a 15.7% drop – which is quite a lot! Even though we’ve only had 36 games in 2016, that’s enough for us to be confident that the difference in average stoppages isn’t just due to chance. It looks like the league has succeeded in reducing the number of stoppages per game. That’s a good thing for anyone who likes to see more free-flowing play – in other words, people with the correct aesthetic preferences. Note: Figures in this post are correct as at the end of Round 4, 2016. This post uses ‘hit outs minus goals’ as a proxy measure for stoppages. Given that a hit out comes from a ruck contest, which follows a stoppage, a rise or fall in the number of hit outs should reflect a rise or fall in the number of stoppages. We don’t want to include stoppages that follow a goal, so that’s why we subtract the total number of goals in the game kicked by either side from the total number of hit outs to arrive at our measure of stoppages.